Welcome to the Hydro-Flex Hose (Western) Limited web site. Please take a moment to read the following company information. 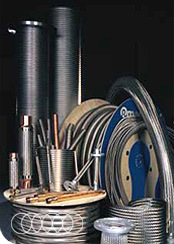 Hydro-Flex Hose (Western) Limited was established in 1980 to service Canada with high quality Corrugated Stainless Steel Metal hose, Teflon hose, and all types of Expansion Joints. Since then we have committed ourselves to achieving a standard of excellence in the fabrication of stock pump connectors, custom corrugated metal hose assemblies and stainless steel expansion joints. Our outstanding and unmatched service has been a key factor in our continued success for over 25 years. With on-call staff, "B" pressure welders, and pleasant and knowledgeable order desk personnel, we can provide the service you expect when you need it. Over the years, we have realized that sacrificing quality is not an option for most of our customers. Therefore we only deal with manufacturers that consistently supply superior products. This philosophy has helped our customers reduce equipment down time, high replacement costs and, avoid lacks of production by experiencing considerably longer service life from our products. Check our products page for a complete list of products that we carry. This page will be updated on a regular basis as we continue to add new products to our existing line. We welcome any and all comments about this web site, as we strive to make your purchasing experience with Hydro-Flex Hose both easy and enjoyable. Please call our toll free number to speak directly to one of our office personnel. We invite you to call our order desk with your inquiries, or if you trust this site you can send in your order inquiries buy e-mail through our quote page. One of our highly trained order desk staff will be happy to assist you with your flexible piping requirements.